2 Bidhan Chandra Krishi Viswavidyalaya, Mohanpur, West Bengal-741252, India. 4 Bidhan Chandra KrishiViswavidyalaya, Mohanpur, West Bengal-741252, India. 5 ICAR-Central Soil Salinity Research Institute, Karnal-132 001, Haryana, India. Rice is one of the most important crops in the world and it contributes more than two thirds of the energy intake of population of South and South East Asia including India (Timsina et al., 2010). About 45.5 million hectares of land in India is covered with rice producing 99.2 MT of grains, which contributes about 22.1% of world production (AIREA, 2008-09). Monoculture of rice using high yielding varieties and only inorganic fertilizers have been proved to stagnate rice productivity (Ladha et al., 2003), and the system is accredited with reducing fertility, nutrient supplying capacity and overall health of soils. In fact, results from long-term fertilizer experiments conducted throughout the world have revealed that application of only inorganic fertilizer to such rice-based system has damaged almost all good soil attributes for crop production including physical, chemical and biological properties (Basak et al., 2016). Maintaining the sustainability of such a production system is the need of the hour to achieve food security. Organic carbon (OC) is the panacea for sustaining soil health. However, it is a major challenge to maintain or improve low-level stock of OC in soils of arid and semi-arid regions (Srinivasarao et al., 2012a, 2014). The problem is aggravated due to heavy soil-mining practices with little or no crop residues incorporated back into the soil, excessive tillage, ubiquitous imbalance in fertilizer use and severe unavoidable soil degradation by erosion and other obvious processes (Lal, 2009). Lal (2011) quantified that increasing the SOC stock by unit Mg C ha-1 y-1 in the root zone is supposed to increase annual food production in developing countries by 2432 million tons of food grains and 610 million tons of roots and tubers. Quantifying the pools of organic carbon in soil under different management practices is needed for improving quality and sustainability of the soils (Tian et al., 2015; Bharali et al., 2017). 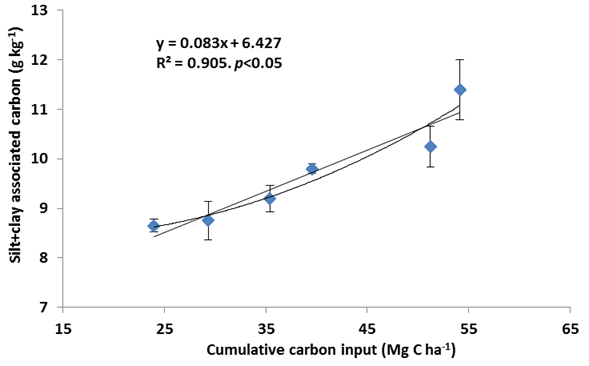 Organic carbon concentration determined by Walkley and Black (1934) and Nelson and Sommers (1982) methods may not be enough to assess the effect of management practices on the quality of a system to maintain soil sustainability (Chan et al., 2001). There are a few parameters of OC in soils including those of different pools. Computing relationships among those parameters viz., sensitivity index, carbon management index, critical C input and carbon pools with crop productivity will be useful in formulating better management practices for facilitating carbon sequestration and maintaining sustainability of production system in long run. One of the easy way to achieve this is to study the changes in different fractions of carbon with different stabilities and turnover rates as a function of agricultural management practices. Globally, most agro-ecosystems are experiencing increased nutrient inputs especially of anthropogenically derived nitrogen (N), which are about 30-50% greater than that from natural sources and tenfold greater than 100 years ago (Zang et al., 2016). As most of the soils in India are deficient in N, its enrichment could affect crop biomass as well as below ground processes. This includes microbial activity, decomposition of organic carbon and its allocation into different pools. With the aim to explain temperature sensitivity of microbial C decomposition in soil aggregates through the use of the thermodynamic parameter Q10, Muñoz et al. (2016) showed that decomposition in soils from rainy zones was more sensitive to temperature increase than that of soils from drier areas. Tian et al. (2016) elaborately and essentially tried to explain the effect of different biotic and abiotic factors on SOC in semi-arid grassland and suggested to establish grassland to improve the potential of SOC sequestration. All these observations may help to explain the results of our present study on C dynamics under a regime of inorganic N in dried area. Assessing the true value of SOC in monetary terms is impractical as it is equal to monetary equivalent of ecosystem ser vices provisioned (Lal, 2014). The ecosystem services include increasing net primary productivity and agronomic yield in the context of food and nutritional security, improving plant available water capacity in the root zone, reducing water runoff and soil erosion, mitigating/adapting to cli mate change, denaturing pollutants and purifying water, and enhancing biodi versity. Assessing monetary value of these services is thus a major challenge (Costanza et al., 2014). Whereas, assessing the value of soil carbon sequestrated in monetary terms is practicable. As it depends on monetarily measurable factors like soil, crop management practices and land use. We made a modest attempt to evaluate the cost of C sequestration out of the present study, which could be used in trading of carbon in national and international markets, besides benefitting farming community. Studies on the effect of long-term fertilization and cropping systems on C dynamics are well documented by many researchers in India, but these studies are limited to Indo-Gangetic Plains (Mandal et al., 2007; Majumder et al., 2007; 2008), eastern India (Ghosh et al., 2010), western India (Chaudhary et al., 2017) and to some extent in extra peninsular of north eastern region (Bharali et al., 2017). However, there is hardly any study on C dynamics, potential and cost of C sequestration in soils as influenced by long-term fertilization and cropping system in Deccan plateau or semi-arid region of southern India. Serious degradation in natural resources in the region demands rehabilitation measures tailoring crop and soil management practices for long-term sustainability of its agro-ecosystem (Srinivasarao et al., 2012b). Summarizing results of a number of studies, Lal (2004) concluded that improved fertility management can enhance the SOC content at the rate of 0.05-0.15 Mg ha−1 y−1. Again, Benbi and Brar (2009) observed that adoption of balanced fertilization influenced C sequestration in soils due to their effects on crop growth; while Pathak et al. (2011) reported, on an average, C sequestration rate of 0.17% under NPK+FYM compared to NPK treatments. As a ready prescription, optimal level of SOC can be achieved and maintained through adoption of an appropriate crop rotation (Wright and Hons, 2005), INM (Schuman et al., 2002; Mandal et al., 2007; Majumder et al., 2008), and conservation tillage (Lal, 2009). Relationship among the sensitivity index, carbon management index, critical C input and carbon pools with crop productivity will help in formulating better management practices thereby facilitating carbon sequestration and maintaining sustainability of the production system in long run. In the present study, an attempt has been made (i) to determine the impacts of long-term intensive double rice cultivation on SOC stock and its sequestration potential, (ii) to measure the effect of different levels of fertilizations in reallocation of organic carbon into different pools and (iii) to measure cost of carbon sequestration for attaining a higher crop yield sustainability, using a 14-year-old long-term fertility experiment in an Inceptisol located in a semi arid region of southern India. A long-term field experiment with rice-rice cropping system was established in 2000 at the experimental farm of the Regional Agricultural Research Station, Jagtial (18°45’ N, 78°45’ E, 71 m above sea level), Telangana, India located in semi-arid eco-region. The experimental site receives an average annual rainfall of approximately 750-900 mm and experiences mean annual minimum and maximum temperatures of 20.0 and 33.6°C, respectively. The soil was classified as Typic Ustochrept. The site had the soil moisture and temperature regimes of ustic and isohyperthermic, respectively, and the length of growing period (LGP) in between 90-150 days in a year. It had pH of 7.1, EC 0.47 dS m-1 and contained 382, 280, and 338 g kg−1 of sand, silt, and clay, respectively. The initial surface soil (0-15 cm) of the experimental site had total organic C of 9.4 g kg−1, bulk density of 1.47 Mg m−3 and available N, P and K were 107.6, 19.6 and 364 kg ha-1, respectively. Two rice (Oryza sativa L.) crops (cv. JGL 3855) were grown in sequence annually during the experimental period (2000-2014). The experiment was laid out in randomized block design with the following treatments: (i) control (plots without NPK fertilizers and organics), (ii) 50% NPK (60:30:20 kg ha-1), (iii) 100% NPK (120:60:40 kg ha-1), (iv) 150% NPK (180:90:60 kg ha-1), (v) 100% NPK + FYM (5 Mg ha-1 season-1), (vi) FYM, 10 Mg ha-1 season-1 and (vi) Fallow [no crop cultivation since initiation of the experiment, but native vegetation (grasses, herbs etc.) allowed to grow without any inputs and dressed down annual leaving the biomass onto the plot] in three replications. Requisite amount of well-decomposed FYM was applied to the specified plots (size: 12 m × 9 m, as per the treatment structure) 7 days before (with the onset of monsoon) ploughing for winter rice using a power tiller for well mixing with the soil. The field were ploughed thoroughly and flooded 2-3 days before transplanting for puddling and levelling. Twenty five days old seedlings were transplanted at a spacing of 15 cm × 15 cm with two seedlings per hill in the field plots during mid-August. Similarly, summer rice was transplanted in mid-January with 30- day old seedlings because of their slow growth during winter. Three representative soil samples were collected 10 days after harvesting of winter rice in 2014 from each of the plots in each replication from 0 to 15, 15 to 30 and 30 to 45 cm depths with a bucket auger and pooled together to make composite sample for each depth and replication. After hand crushing and passing through a 2.0-mm sieve, the soil samples were stored at 4°C, and used fresh within 24 h for estimating soil microbial biomass C. A portion of the field moist soil samples was air dried, passed through 0.5 mm sieve, and used for analysis of different pools of C. Bulk density was measured following the method as described by Blake and Hartge (1986), using triplicate samples collected from all three depths of each replication using a core sampler (0.05 m in diameter, 0.08 m in length). Soil organic carbon (SOC) was determined by using wet combustion method as described by Walkley and Black (1934). Different fractions of SOC were estimated through a modified Walkley and Black method as described by Chan et al. (2001) and Mandal et al. (2008) using 5, 10 and 20 ml of concentrated H2SO4 (which corresponded respectively to 12.0 N, 18.0 N and 24.0 N of H2SO4). The amount of SOC determined using 5, 10 and 20 ml of concentrated H2SO4 when compared with TOC, allowed separation of TOC into the following four different fractions of decreasing oxidizability. Labile (L or Cpool II): difference in SOC extracted between 18.0 N and 12.0 N H2SO4. Less labile (LL or Cpool III): difference in SOC extracted between 24.0 N and 18.0 N H2SO4. Non-labile (NL or Cpool IV): residual organic C after reaction with 24.0 N H2SO4 when compared with the TOC. Active soil carbon was determined by potassium permanganate (0.02M KMnO4) oxidation method (Blair et al., 1995). It is very labile fraction of organic C sensitive to management practices. Particulate organic carbon was estimated by separating organic and mineral fractions of SOC sized between 53-200 microns and measuring by CHNS (Elementer Vario El Cube, Germany) analyser (Hassink, 1995). It varies from active soil carbon as it is often associated with the slow pool of organic C (Cambardella and Elliott, 1992). Microbial biomass carbon in the soil samples was estimated through chloroform fumigation and incubation method as outlined by Vance et al. (1987). Both fumigated and non-fumigated samples were extracted with 0.5 M K2SO4. The difference between C obtained from the fumigated and the non-fumigated samples was taken to represent the microbial C-flush and converted to microbial biomass carbon dividing C-flush with 0.41 (Voroney and Paul 1984). Where, C content is given in g C kg-1, BD in Mg m-3, depth in m and C stock in Mg ha-1. where Y is the average yield. σ is its estimated standard deviation, and Ym is the observed maximum yield in the experiment during the years of cultivation (Sharma et al., 2005). The cumulative C input values for the studied cropping systems were computed using harvested yield data for the last 14 years (2000-2014). Empirical equations were used to estimate crop residue-derived C inputs. Stubble biomass and rhizodeposition C of rice, was assumed to be 2.5 and 15% of total above ground biomass at maturity and root biomass assumed as 19 and 14% of total above ground biomass for control and other fertilized treatments, respectively (Bronson et al., 1998). The extra C input through photosynthetic aquatic organism of rice was also accounted following Saito and Watanabe (1978). The estimated C concentrations of rice stubbles and root residues were 31.8 and 41.2%, while mean C concentrations of FYM was 26.4%, respectively. The data were analysed using randomized block design (RBD). Statistical analysis was performed by DOS-based SPSS version 17.0. The SPSS procedure was used for analysis of variance (ANOVA) to determine the statistical significance of treatments. The 5.0% probability level is regarded as statistically significant. Intensive cultivation of double rice with recommended doses of fertilization (100% NPK and 150% NPK) and C supplementation (100% NPK+FYM and 100% FYM) caused an increase in TOC concentration in soil where as imbalanced fertilization (50% NPK and control) decreased the same as compared to its (TOC) initial value and value with no cultivation fallow (Table 1). Carbon supplemented treatments like 100% NPK+FYM and FYM maintained as much as 9.2 and 21.8% higher TOC, respectively over the 100% NPK. Irrespective of treatments, we found abrupt decline in SOC concentration along soil depth, with middle (15-30 cm) and lower (30-45 cm) layers contained only 27.4 and 17.6% of total profile (0-45 cm) carbon content. Oxidisable organic carbon concentration of surface soils (0-15 cm) was significantly increased with the application of inorganics, organics alone and combination of both, over the control treatment (Table 1). Cultivation over the years caused a net decrease in profile SOC under 50% NPK and control treatments as compared to no cultivation fallow and the magnitude of decline was 8.0 and 0.4%, respectively. On the other hand, 100% NPK, 150% NPK, 100% NPK+FYM and FYM treatments showed 10.0, 10.9, 20.2 and 25.8% increase in SOC, respectively over its value in fallow. Contents of SOC decreased abruptly in 15-30 and 30-45 cm soil depths compared to the surface soil under all the treatments. The magnitude of decline between the lower depths (15-30 and 30-45 cm) was, however, non-significant. *values in the same column followed by different letters are significantly different at P<0.001 according to Duncan’s Multiple Range Test (DMRT) for separation of means, ± indicates the standard deviation values. The magnitude of carbon pools extracted under a gradient of oxidizing conditions was as follows: CVL > CLL > CNL > CL constituting about 41.4, 20.6, 19.3 and 18.7%, respectively, of the TOC (Table 2). However, the contribution of VL, L and LL pools to SOC was 51.2, 23.1 and 25.5%, respectively. While active pool (CVL + CL) constituted about 60.1%, passive pool (CLL + CNL) represented 39.9% of the TOC. Among the treatments, 100% NPK+FYM (44.4%) maintained a proportionately higher amount of soil C in passive pools. With an increase in the dose of fertilization, on average, C allocation into passive pool was increased (33.0, 35.3, 40.7% and 39.3% of TOC under control, 50% NPK, 100% NPK and 150% NPK treatments, respectively). Permanganate oxidizable carbon (POx-C) represents 3.7-4.6% of TOC (Table 3). Organics applied treatments showed significantly higher POx-C irrespective of soil depth. In fact, the POx-C is very sensitive to crop management practices as it varied significantly in all the treatments tested. Table 3 Effect of crop management on permanganate oxidizable carbon (POx-C) particulate organic carbon (POC), microbial biomass carbon (MBC) and silt+clay associated carbon (mg kg-1) and sensitivity index of soil organic carbon and labile fractions of soil organic carbon in surface soil (0-15 cm). Intensive double rice cultivation without any amendments (Control) significantly decreased the particulate organic carbon (POC) ~1.8% when compared with no cultivation fallow in surface soil (0-15 cm), on the other hand increased over 0.6, 9.0, 13.2, 23.4 and 58.1% under 50% NPK, 100% NPK, 150% NPK, 100% NPK+FYM and FYM treatments, respectively (Table 3). Carbon associated with silt and clay fractions is stable in nature and it is increased with increasing carbon inputs into the soil. Organic amended treatments (FYM and 100% NPK+FYM) showed significantly higher silt+clay associated C values over the fallow, control and 100% NPK only treatments in surface soils (0-15 cm). Different doses of fertilization had non-significant effect on it (Table 3). 100% NPK+FYM and FYM treatments showed an increase in silt+clay C of 11.4 and 23.9% over the 100% NPK (Table 3). Microbial biomass carbon (MBC) followed the same trend as oxidizable organic carbon. Higher amount of MBC was observed in FYM treatment followed by 100% NPK+FYM, 150% NPK, 100% NPK, fallow, 50% NPK and control (Table 3) indicating the additive effect of organics onto the MBC. Continuous cropping with no fertilizers (control) and insufficient fertilizers (50% NPK) resulted in a net decrease in TOC by 9.2 and 5.1%, respectively compared to its initial value in soil under rice-rice system. However, cultivation with balanced/sufficient mineral fertilizers and organics increased the TOC by 2.4, 4.7, 13.8, 28.8 and 6.8% under 100% NPK, 150% NPK, 100% NPK+FYM, FYM and fallow treatments, respectively. All these resulted in a net gain or sequestration of SOC under different treatments as follows: FYM (8.4 Mg ha-1) > 100% NPK+FYM (3.4 Mg ha-1) > fallow (1.5 Mg ha-1) > 150% NPK (1.0 Mg ha-1) > 100% NPK (0.6Mg ha-1) but a loss or depletion in 50% NPK (1.2 Mg ha-1) and control (1.8 Mg ha-1). Carbon sequestration potential of the treatments also followed the same trend i.e. FYM (0. 60 Mg ha-1 y-1) >100% NPK+FYM (0.24 Mg ha-1 y-1) > fallow (0.11 Mg ha-1 y-1) > 150% NPK (0.07 Mg ha-1 y-1) > 100% NPK (0.04 Mg ha-1 y-1) (Table 4). The amount and proportion of C applied in the form of FYM converted to SOC was computed (through equation 4) and it was observed that out of 13.72 Mg of C contained in the 140 Mg of FYM per ha, only 2.83 Mg could be accounted for in the 100% NPK+FYM treatment. This indicated that 28.9% of the applied FYM-C was stabilized in the form of SOC allowing 71.1% to go out of the system. Table 4: Carbon sequestration in surface soil (0-15 cm) after 14 years of application of inorganic fertilizer and organic manures in a rice-rice cropping system. Cultivation over the years with control and 50% NPK treatments caused a net decrease in both SOC (8.5 and 0.7% of the fallow, respectively) and TOC (13.8 and 2.8% of the fallow, respectively). Cultivation of double rice for 14 long years involved intensive tillage and puddling that destroyed soil structure, and subsequently affected distribution and stability of soil aggregates (Six et al., 2002) resulting in a decline in carbon content of soils. Our results are in line with Mandal et al. (2007) and Majumder et al. (2007, 2008) who reported similar magnitude of depletion in SOC (2-15% of fallow) in subtropical India. In contrast, Lal (2004) reported, on average, 41% depletion in SOC in different regions of India including 57% in Deccan Plateau. Lower magnitude of depletions in SOC observed in our study was primarily due to submergence of soils under rice-rice system for 8-9 months in a year. Higher SOC concentration in rice soils than in upland soil has been ascribed to favourable water regime during the rice season (Lal, 2004). Significant increase in SOC concentration from < 5.0 g kg-1 in 1973 to about 8.0 g kg-1 in 1994 in soils under rice with integrated nutrient management was also reported (Swarup, 1998). Another possible reason for lower depletion might be due to lower inherent carbon concentration of the experimental soil. However, sole application of FYM and in combination with 100% NPK significantly increased carbon content in soils. This was simply due to an increased biomass of crops (root biomass and root exudates) with complementary effect of organic and inorganic fertilizers. A similar build up of SOC due to cropping with combined application of fertilizer and FYM was reported by Majumder et al. (2008), and Chaudhary et al. (2017), with sole FYM by Srinivasarao et al. (2012b). Treatments with external application of FYM showed a higher amount of POC than those with NPK. Chaudhary et al. (2017) also reported a higher POC in FYM treated soils, and explained that it originated from recalcitrant litter (Puget and Drinkwater, 2001), and root and microbial biomass debris (Purakayastha et al., 2008). Greater C concentrations in POC than silt+clay fraction (Table 3) indicated that carbon from crop residue and manure are more likely to accumulate in coarse size and light density fractions rather than in fine size. Results of lack of substantial accumulations of uncomplexed organic matter or lower amount of carbon in silt+clay fractions indicated that the mineral associated pool has not yet reached the (C) saturation (Feng et al., 2014). This assertion was supported by the observations that silt+clay fractions did not exhibit an asymptotic relationship with C inputs (Figure 1). The results thus indicated that silt+clay fractions still have a substantial C saturation deficit, and could stabilize additional amounts of C inputs. The C saturation deficit of soils of the present study after cultivation of double rice for 14 years with organics may be due to the shorter duration of the experiment and application of a limited/ insufficient amount of organics as well as a lower initial SOC concentration of the soils (Stewart et al., 2007; Feng et al., 2014). Figure 1: Relation between cumulative carbon input and silt+clay associated carbon (error bars represent the standard error of mean). There was an increase in the amount of carbon sequestrated in soils with the increasing levels fertilizer from control to 150% NPK. However, the relation between fertilizer levels and amount of carbon sequestrated followed a sigmoid curve. Amount of carbon sequestrated increased rapidly or linearly with increased fertilizer levels up to 100% NPK, and then the degree of increase in the amount of carbon sequestrated decreased (Figure 2). 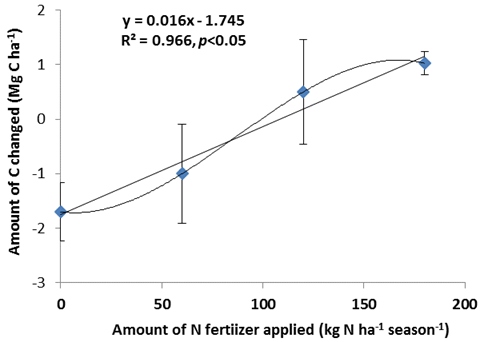 Figure 2: Relation between amounts of carbon change with N fertilizer applied (error bars represent the standard error of mean). There was an increase in the allocation of sequestrated carbon into passive pools (LL and NL) with an increase in fertilizer quantity up to 100% NPK, then it decreased with 150% NPK. An increase in N inputs over the recommended dose (100% NPK) possibly made the plants more succulent (i.e. reduced lignin and cellulose contents in plant tissue) resulting in an ease in their decomposition and enhancement in microbial biomass or active pool of C in soil with a concomitant drop in percent distribution (of TOC) into passive pools. Application of different levels of fertilizers also influenced allocation of C into different pools, besides TOC and OC. Excepting fraction 2 (labile pool), all the pools of C estimated with a gradient of oxidizing conditions recorded an increase with fertilization compared with the control treatment. Increasing levels of fertilizer (inorganic N inputs) could induce a positive priming effect resulting in a net loss of soil C (Russell et al., 2005), especially when crop residue was not returned to the soil. In our case the reduction was observed in the amount of labile pools. The sensitivity index helps to identify the C fractions which are more responsive to management practices. The results indicated that MBC (31.2-129.7%) and KMnO4 (12.4-92.8%) fractions were the most sensitive ones as compared to OC, silt+clay associated and POC fractions estimated through Walkley and Black (1934), and dry combustion (CHNS analyser) methods with sensitivity index values ranging between 2.5-33.4, 1.2-31.8 and 17.6-85.9%, respectively (Table 3). The C pool with higher sensitivity index could be an early indicator with respect to changes in C status of soil due to management practices. In this study under double rice cropping system in Inceptisols, MBC is the most sensitive indicator of soil carbon dynamics and quality. The superiority of POC over the SOC as a good sensitive indicator was also reported by Yan et al. (2007). Carbon management index (CMI) is an important tool to compare and evaluate the efficiency of different management practices or soil productivity. It accounts for the changes in both labile and total C; and could be a better indicator of sensitivity of SOC to management practices. Higher CMI values indicate that the management practices are sustainable to maintain SOC. In the present study sole organic and in combination with inorganic application showed higher CMI values than sole inorganic treatments. These higher values might be due to application of external C inputs to soil and these practices could maintain stable SOC than other systems (Chaudhary et al., 2017).In the present study FYM and 100% NPK+FYM treatments had higher CMI (Table 5) indicating greater stable SOC. This was corroborated by the presence of higher C in passive pool under the treatments. Improved CMI values under integrated nutrient management system also reported by Moharana et al. (2012). From these results we could conclude that the application of organics had a higher rehabilitation rate. CMI= Carbon management index, SYI= Sustainable yield index, PFP= Partial factor productivity, B:C= benefit: cost ratio. The amount and rate of carbon sequestration were significantly increased in the treatments with application of organics alone and in combination with inorganic fertilizer. This was due to increased amount of plant residue (0.17, 1.21 and 1.30 Mg C ha-1 y-1 through stubble biomass, root biomass and rhizodeposition, respectively) C left over in soil (2.68 Mg C ha-1) owing to increased yield, external application of C through FYM (0.98 Mg C ha-1) and interaction between NPK and organics (Majumder et al. 2008) in integrated treatment. On the other hand, in sole FYM treatment it was due to a large amount of external carbon addition (1.96 Mg C ha-1) and increased amount of plant residue (1.91 Mg C ha-1). This was evident from the significant positive correlation (r=0.84, p<0.05) between annual C inputs and TOC. The slope of the linear regression (carbon sequestration efficiency, CSE) between the SOC sequestration rate and gross carbon inputs was 28.4, which indicated that 28.4% of C input per year was sequestrated as SOC. Results showed that only 28.9% of applied FYM was stabilized in soil allowing 71.1% to go out of the system. Contrarily, Majumder et al. (2008) and Mandal et al. (2008) showed a higher amount of carbon stabilization (73 and 67.8% of applied FYM, respectively) in soils while working with rice-based cropping system in Inceptisol in eastern part of India. Such lower carbon stabilization in our study may be due to strong oxidative forces of the high temperature (temperature goes upto 47-48oC during peak summer) prevailing in this region during summer, when the soils remain fallow. A significant positive linear relationship between the changes in SOC and the total cumulative crop residue C inputs to the soil over 14 years (Y= 0.284x - 9.308; R2= 0.84, p<0.05) was observed (Figure 3). Many researchers (Mandal et al., 2007; Srinivasarao et al., 2012b) also observed similar relationship. The figure depicted a strong linear relationship indicating that even after 14 years of C addition through FYM and crop residues, the soils had still capacity to store C and had potential for further sequestration. The slope of the curve represented the rate of conversion of input C to SOC, which is about 28.4% of each additional Mg C input per hectare under the tested cropping system. The results also revealed that in order to maintain the existing SOC level (zero change) for long-term sustenance of the production system, a critical amount of 2.34 Mg C ha -1 y-1 has to be incorporated into the soil (Figure 3). Figure 3: Relationship between cumulative C input and C sequestration and critical C input value for zero change in soil organic carbon (SOC) stock (error bars represent the standard error of mean). Results of calculation of benefit: cost ratio (B:C) for different treatments showed that 100% NPK treatment helped to get more profits over the other treatments tested. The B:C ratio increased with increasing dose of fertilization upto 100% NPK, then decreased with 150% NPK (Table 5). In 150% NPK treatment yield was increased but the cost of inputs were higher than the increased yield price, hence B: C ratio declined. Treatments with organics i.e. 100% NPK+FYM and FYM showed lower B: C ratio (2.2 and 1.3, respectively), as the cost of organic inputs (FYM) was higher. The cost of carbon sequestration in soils under agricultural land uses is the function of cropping system, intensity and management practices. Among the treatments compared FYM treated soils showed lower cost for sequestering unit carbon (81 kg-1 C) followed by 100% NPK+FYM (204 kg-1 C), 150% NPK (600 kg-1 C) and 100% NPK (906 kg-1 C). Results indicates that 100% NPK treatment can bring more profits to the farmers but failed to maintain soil sustainability, on the other hand FYM applied treatment can fix more C and have greater potential to maintain soil sustainability and quality but failed to bring good profits. But integrated treatment 100% NPK+FYM can capable of generating more profits besides maintaining soil sustainability. This was also supported by higher SYI in NPK+FYM treatment. 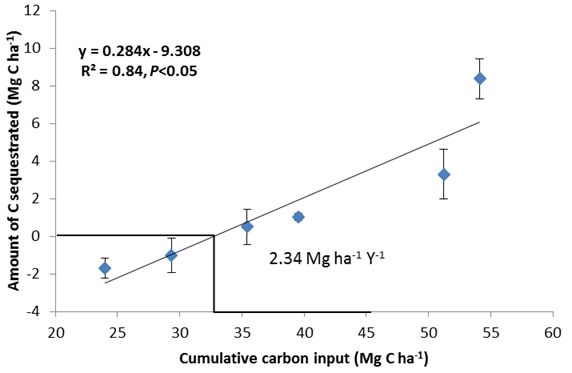 Carbon sequestration had significant (p<0.01) positive correlation with very labile C (r=0.71), non labile C (r=0.80), MBC (r=0.84), POC (r=0.87), Pox-C (r=0.83) and silt+clay associated C (r=0.89). Our findings were in line with Datta et al. (2015) who also observed significant positive correlations among the SOC pools under different land uses in semiarid North West India. The SYI had significant (p<0.01) positive correlations with labile and non labile C pools (r=0.51, p<0.05) and cumulative C input values (r=0.51, p<0.05). Organic matter in soil acts as a storehouse of nutrients. Higher C inputs helped in enhancing organic matter content in soil which, in turn, supplied nutrient elements to plants and thereby improved crop yield and justified the existence of significant positive correlations among SOC pools, C inputs and SYI. Double rice cropping system even under hot semi-arid climate with balanced and integrated (with FYM) nutrient management caused an increase in SOC. However, a higher part (71%) of the applied C was lost leaving a lower amount (29%) to stabilize into soil. To counteract the loss and maintain the SOC under such climate a minimum of 2.34 Mg C ha-1y-1need to be incorporated into soil. Nutrient management with organic maintained a good amount of C in microbial biomass, and other labile pools besides a higher value of carbon management index and sensitivity index. Management practices with 100% NPK+FYM showed a greater crop yield sustainability with lower cost of carbon sequestration. Double rice system with balance fertilization (100% NPK+FYM) thus not only helped to sustain the crop yield but also health of soils under hot semi-arid climatic conditions. We are grateful to Dr. K. Raja Reddy, former Director of Research, Acharya N.G. Ranga Agricultural University, Hyderabad, for allowing us to use the long-term experiment and providing basic initial soil data for our study.